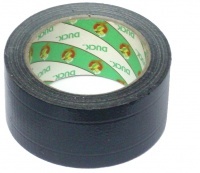 Duct tape is cloth reinforced rubber Adhesive tape. It has so many uses it belongs in any DIY toolbox. Ironically the one use it is not ideal for is ductwork, as heat causes premature failure. 2 How tough is duct tape? Stick across rearside of a small plasterboard hole, apply a piece of card or plastic to block the hole, then fill the hole. Attach a strip to the end of a stick to retrieve out of reach objects. Or get the stick stuck. Remove splinters and cactus spikes: apply duct tape, pull off. How tough is duct tape? Screwfix 14470 unbranded was criticised for inadequate strength and for the backing fabric being weaker than the adhesive, both of which caused it to break up during application and removal. It also failed in one wet application, though was fine in another. Jewsons own brand was described as not very sticky. Duck brand 'power' tape, Screwfix 58451 orange, 84155 white, 63959 clear and 84740 black. Carpet tape (double sided fibre reinforced) was recommended. TLC Gaffa tape was recommended as very sticky. Self-amalgamating tape was recommended as better for apps where the tape needs to stick to itself, but no use for when the tape has to stick to other things instead. This page was last modified on 12 June 2018, at 15:42. This page has been accessed 13,835 times.